39538	PH 23 Nov 1944 : Mrs. Beatrice Bruns; Charlie Bruns. Thanksgiving. 1944: Charles Lawler Bruns, boatswain’s mate, 2/c USN, and the fifth generation of his family to fight for his country, nibbles a celery stick as he watches his mother, Mrs. Beatrice M. Bruns of 53 Berwick Street, get the turkey ready. 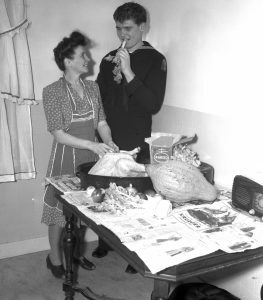 It will be the first time in two years that Boatswain Mate Bruns has been home for Thanksgiving dinner. He will sharpen his appetite for it at the Deering-Portland High School Thanksgiving Day game at Portland High School Stadium. A graduate of PHS in 1942, Bruns has played tackle for the Blue in the Turkey Day classic. A veteran of the Normandy invasion, Boatswain Mate Bruns is one of a crew of 25 saved when their LST went down off Normandy after it struck a mine. The Navy recently cited the survivors for shooting down several enemy dive bombers while their vessel was sinking. Bruns has been in the Navy two years. His ancestors fought in the Indian wars, Civil War, Spanish American War and WWI.